To help Archos users fully enjoy DVD and any video file on Archos, 4Easysoft provides a professional DVD/video to Archos Converter - DVD to Archos Suite, which packs with two professional Archos converter software: DVD to Archos Ripper and Archos Video Converter, with which you can freely convert DVD and all popular video formats to the video and audio supported by Archos. Besides, 4Easysoft DVD to Archos Suite is equipped with multiple editing tools for you to optimize the converted Archos video: trim, crop, effect, merge, watermark, etc. All these functions can bring you a wonderful Archos life. Combines DVD to Video Converter and Total Video Converter into the all-in-one tool. So it can rip any DVD to AVI, XviD, WMV, VOB, WMA, MP3 and such video/audio formats. 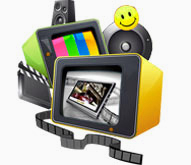 Also convert between all common video formats, even the HD video. With the DVD to Archos Converter, it is easy for Archos users to convert DVD to Archos MP4, H.264/MPEG-4, AVC, AVI, etc. as well as converting DVD to MP3, WAV, etc. for listening music on Archos. 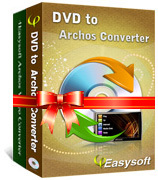 4Easysoft Archos Video Converter enables you to convert MPEG, MOV, WMV, MTS, RM, MKV, MOD, etc. popular videos to Archos supported video and audio formats for enjoyment. Besides converting DVD/video to Archos 705 WiFi, Archos Gmini XS 100, Archos 605 WiFi, Archos 404 camcorder, Archos 404, Archos 504 etc. 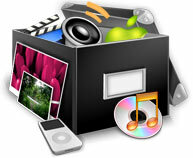 The DVD to Archos Suite is compatible with iPod, iPhone, Apple TV, and all Mobile Phones, PSP, PS3, Wii, Xbox, etc. With this professional software, you can freely adjust the video brightness, contrast and saturation for the output Archos video. 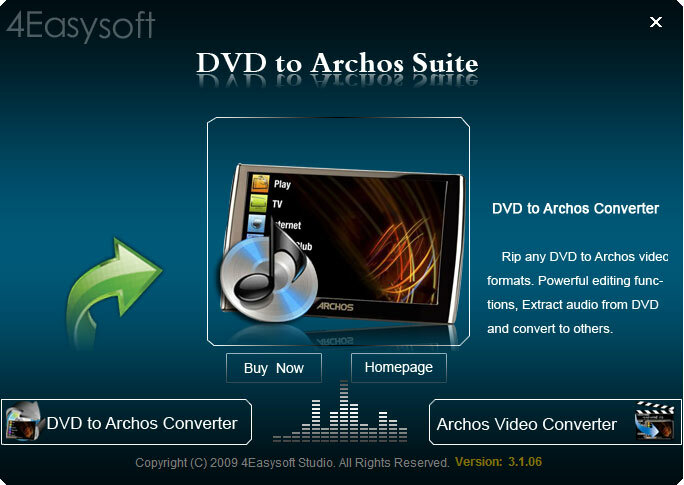 This DVD to Archos Suite can help you convert part video from source DVD/video by setting the exact start and end time. Also it can merge several DVD or video chapters together to output one Archos video. Cut off the black regions and adjust the aspect ratio to change the video play screen to fit your Archos player. You can add text or image watermark to your Archos video and adjust the position/transparency of the watermark. 4Easysoft DVD to Archos Suite allows you to choose audio track and subtitle to further customize your Archos video. This Archos converter package software provides you various video and audio settings to choose: video Encoder, Resolution, Frame Rate, Video Bitrate, audio Encoder, Sample Rate, Channel and Audio Bitrate. This DVD to Archos Suite has the built-in player, which enables you to preview the source DVD/video and converted Archos video. Also you can take snapshot when you preview. 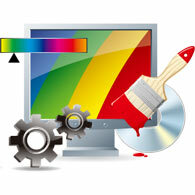 4Easysoft DVD to Archos Suite has the intuitive interface and simple process. It is easy to operate even for beginners. With help of this program, you can convert you selected DVD and video files to Archos with super fast speed and excellent quality. Create personalized watermark to make your video more special. Convert one source file to different formats simultaneously with one conversion. Select audio track and subtitle for output video as you like. How to convert any DVD and video for Archos?